We left the stirrup cays to head south and hit all the remote anchorages. We made it to the other side of little stirrup and called it a day. The seas were big and the wind was right on our nose. We nestled our boat into 6 feet of water with a sandy bottom just around the point. Our draft is 2’-10” and the swells coming in are 2-3 feet. It is high tide and so at low tide we will have 1’-2” between us and the sand with 2-3 foot swells. This was our last option and with the sun setting and all other possibilities ruled out we dropped the anchor. The seas settled but the wind howled all night and every time I felt a wave hit the boat I held my breath in anticipation of hitting bottom. We never felt the bottom hit bottom hit but the next day when we were swimming/ walking around the boat we could see the sand being pushed away every time we gently touched bottom. We anchored here the next night too as the weather was too rough to go anywhere else. We took the dingy over to Little Stirrup Cay to hike to the lighthouse and see the view. Knowing Dan and Preston we did not pull up next to the small beach cove, but the local “garbage dump” or what they called “treasure cove.” After scavenging for gold we hiked up to the lighthouse and watched the waves crash onto the limestone caverns. Yes that is a found cooler on the front of the boat. We have no use for it, but Preston and Dan couldn't pass it up. It is a 4 foot igloo cooler. The next day we headed down the Berry’s with Hoffman’s Cay in mind. We made it to the north tip of Hoffman’s and then proceeded to slowly follow a small “deep” channel, according to the guidebook and our charts, down to the southern tip where the anchorage and blue hole are. We made it about 200 yards in and the depth went from 8 to 2 feet in a couple yards. Basically as we noticed the “channel” was no longer there only shallow sand bars we tried to turn, but ended up grounded. Luckily low tide was in an hour so we figured we would wait it out and high tide would be back in about 8 hours. We weren’t quite beached and we weren’t quite free. After almost an hour of waiting we decided to put the dingy in the water and pull ourselves off the sand. 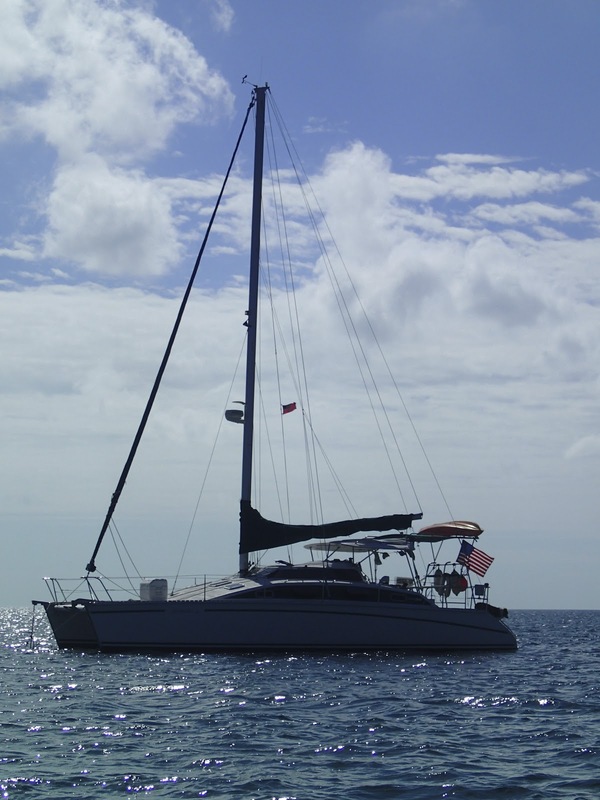 Our little 10’ dingy with the newly purchased 1984 outboard was going to pull our fully loaded 36’ catamaran off a sand bar……… YEAH RIGHT! With Dan in the water lifting the boat one inch and a time, Preston in the Dingy pulling full throttle, and me at the wheel motors just in gear we successfully moved our boat against the wind and current back out into the safe 10 foot waters. Once we were free I was not stopping the boat and Preston was in for a ride as the dingy was soon swung around to the side of the boat and facing the backwards being flooded with water. Dan was running to catch up jumped up the back of the hull and helped Preston get the dingy flipped around. We laughed the whole way back north to Market Fish and Soldier Cay where we anchored in a private paradise. Blocked by the wind and safe from and current and swells we cooked the mackerel we caught earlier in the day and headed ashore to have a fire and blueberry cobbler for dessert. Long day followed with the best night sleep yet also our favorite anchorage so far. Sounds like a lot of sleepless nights but lots of fun adventures! You guys. Always having fun. I love that you guys scavenged and found a cooler in the trash dump. That's hilarious. It looks so great there! Awesome pictures. Preston even sliced his leg open on some old rusted washing machine. He kept saying he was happy he just got his tetanus shot. Wow! Thats alot of work for one day in paradise, I'll bet ya'all slept well. We need some ideas of what to use the cooler for. Ice is hard to come by and my freezer is full of squid for fishing so even my ice trays don't fit. Ohh yeah I was the one driving again when we hit the second sand bar!